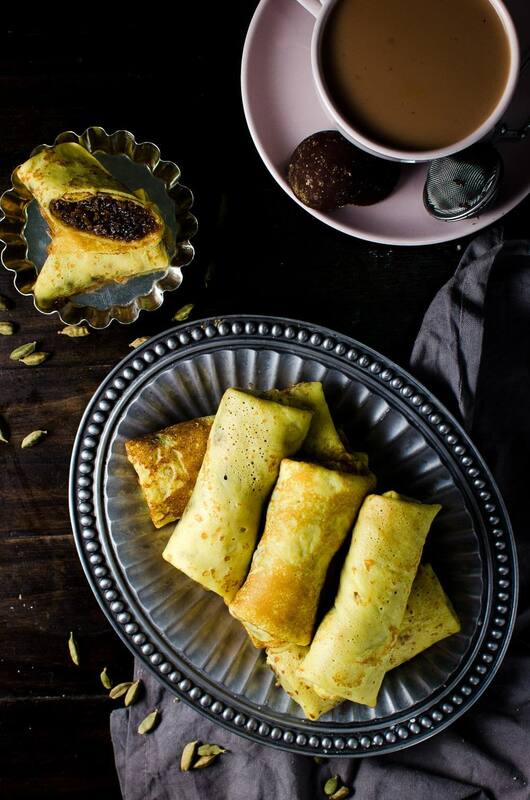 Soft crepes stuffed with a sweet coconut filling – these Pani Pol are a Sri Lankan classic that I loved eating growing up. These Sweet Coconut stuffed Crepes are embarrassingly easy to make and really quite addictive. Perfect tea-time treat or snack. Happy New Year everyone! I’ve got an awesome recipe to kick start the year today. It’s a Sri Lankan classic that I loved eating growing up – called Pani Pol. The direct translation is honey coconut, but there’s no honey in this recipe. They are also called coconut pancakes in Sri Lanka, but these are not pancakes either. Technically they are crepes, stuffed with a sweet coconut filling, eaten as a tea-time treat. Easy to make but hard to stop eating – these Sweet Coconut Stuffed Crepes are one delightful treat that I know you will love! 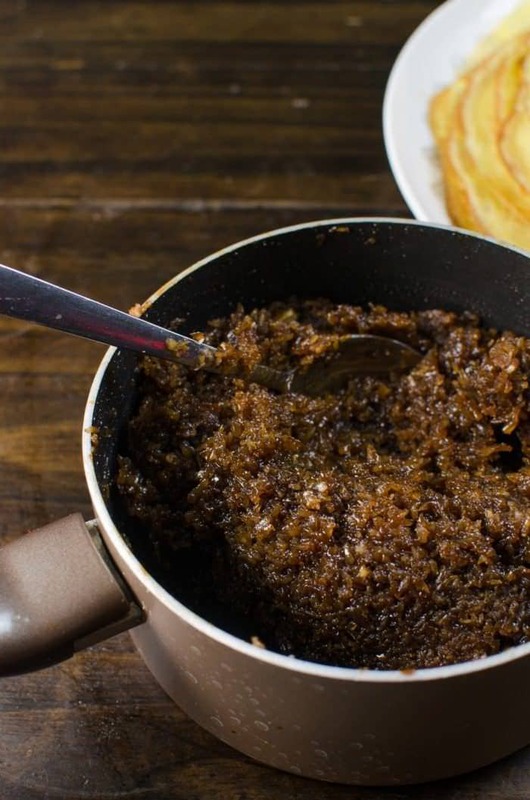 Coconut and jaggery (a hardened block of sugar obtained from the sap of a type of palm tree called Kitul) are two important ingredients in Sri Lankan cuisine. Pretty much every Sri Lankan household would have some jaggery and coconut (coconut milk, fresh coconut, coconut oil etc.) at all times, and a lot of classic sweet treats use those two components quite a bit. See my cardamom spiced coconut custard recipe for example. Alright, so let’s talk about these delicious sweet coconut stuffed creepes (pani pol) briefly, so that you know what to look for when making them. 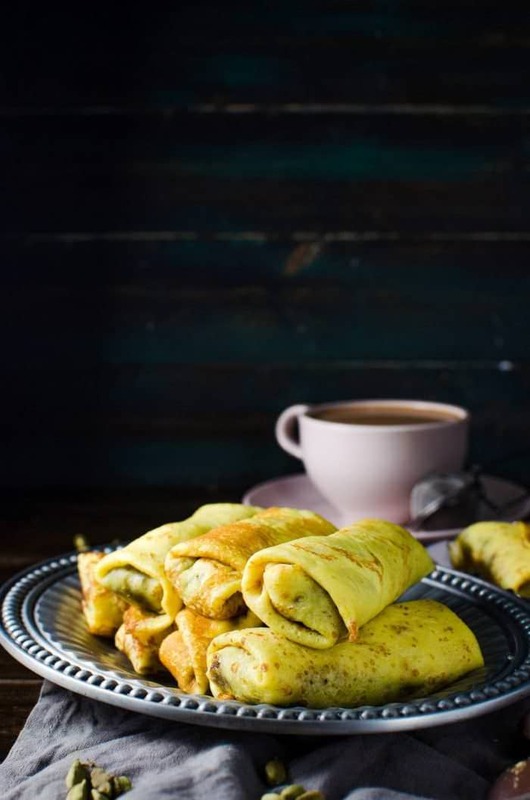 These crepes are traditionally made with a bit of turmeric spice to give them that classic yellow shade, but not so much for the flavor. Since it doesn’t add much in terms of flavor, you can leave out the turmeric for these pani pol if you wish. However, I decided to maintain the classic yellow color of these crepes while also giving them a nice flavor boost by using Saffron instead (having been inspired by my friend Shadi’s Persian cookbook). If you do have some saffron at your disposal, go ahead and try it with these crepes, it’s definitely worth it! Or simply use turmeric for that striking color. If you have neither in your pantry, no worries, skip that step altogether. Fun Fact – crepes are often referred to as pancakes in Sri Lanka (at least when I was young). 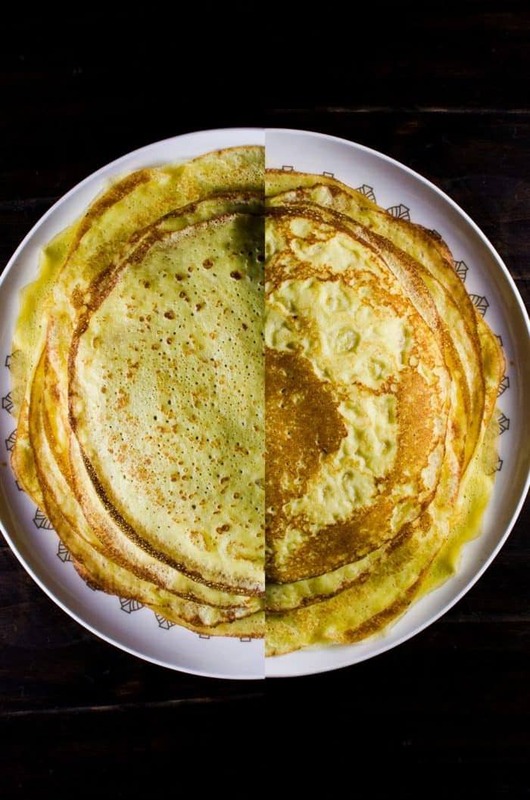 The top of the crepe (L) and the bottom of the crepe (R) – Note the bubbly “craters” on the bottom formed when cooking the crepes on a hot pan. These Sri Lankan-style crepes are a tad different from regular fluffy crepes. They are slightly thicker than French crepes, but are incredibly soft with a rough, “bubbly” surface (as opposed to being smooth). To get that effect, the crepes are cooked in a pan preheated over high-heat, so that the batter bubbles up as it hits the pan. The cook time is also very short for these crepes – less than a minute for each crepe, so you don’t want to leave them unattended. It’s important that the crepes are soft, so that they can be rolled up easily, so overcooking and letting them become crisp is not an option. French crepes are known for having a smooth white surface, with little to no brown spots. These pani pol crepes however, DO have brown spots and that’s part of their charm! 🙂 The high heat of your pan will result in these crepes browning in places with bubbly spots. 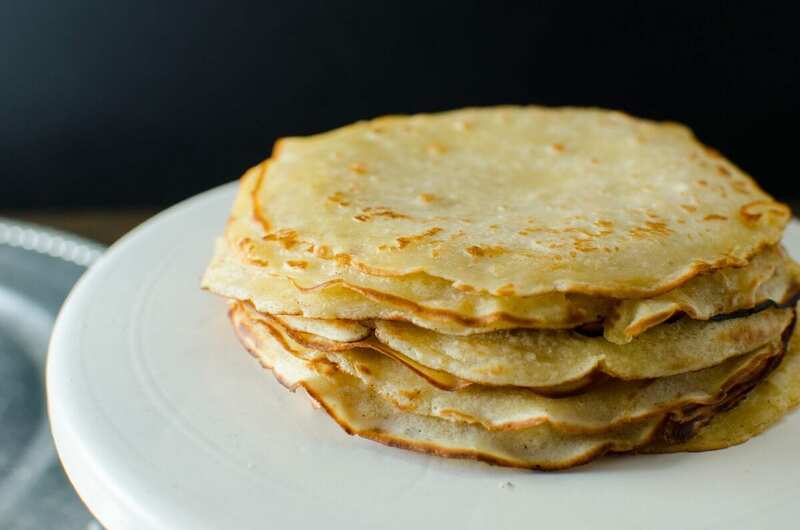 But like I said, that’s all in the appearance (browning does NOT mean crisp here), and they’re just as blissfully soft and delicious as French crepes, so you can make those for this recipe if you like. Want VEGAN CREPES? No problem, I have a vegan crepe recipe that you can find right here. Just pair those vegan crepes with the coconut filling here and you have awesome vegan sweet coconut stuffed crepes! If you do have access to freshly grated coconut, then you’re very lucky indeed! But if you don’t and can’t find freshly grated coconut (like me), don’t despair! I got you covered with this recipe. I will show you how to make this addictive coconut jaggery filling using either fresh coconut or desiccated coconut! Plus, if you can’t find jaggery, no problem. Just use muscovado sugar or dark brown sugar instead. 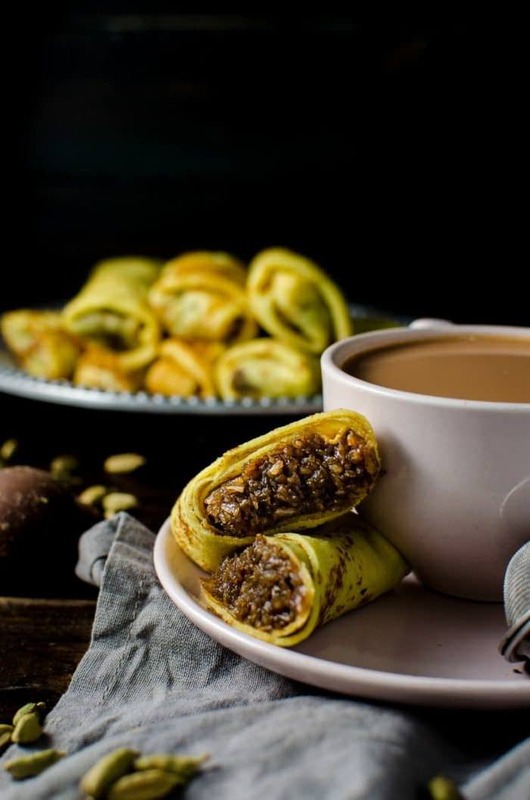 For this recipe, jaggery can be substituted with muscovado or dark brown sugar in a 1:1 ratio (in terms of weight) without a problem. So there you have it. 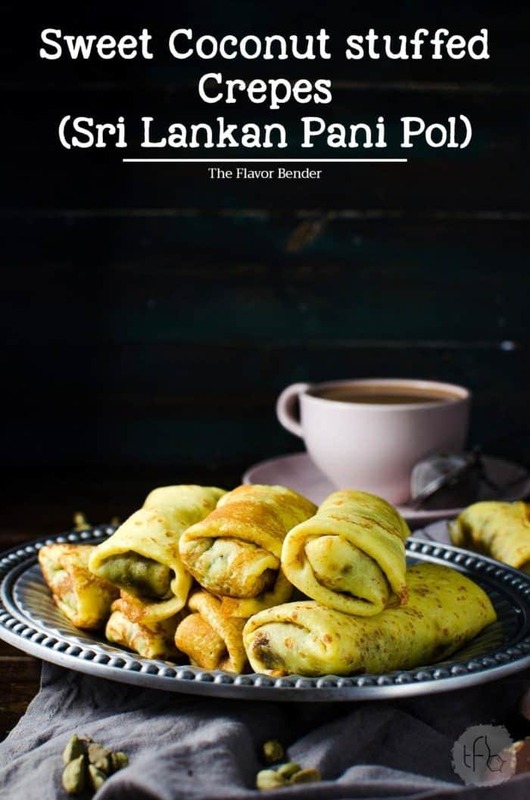 Easy and addictive Sri Lankan pani pol – soft, delicious crepes stuffed with a slightly spiced, sweet, nutty coconut filling. Just the way to start a brand new year. Sri Lankan lore says that to start a new year with something sweet, brings you good fortune and prosperity. And that’s precisely my wish for all my lovely readers too! Add the coconut milk into a saucepan and heat until it's simmering (not boiling). When it starts to simmer, add the desiccated coconut and stir to combine. Remove from the heat and allow the coconut to cool down. This also allows the desiccated coconut to completely absorb the milk. Store the coconut in a bowl, cover and set aside until needed. Combine the sugar, salt, water, cardamom and cinnamon in a saucepan and heat over medium heat while stirring occasionally until the sugar has melted completely. Bring the sugar syrup to a boil. Add the coconut to the sugar syrup and mix well. The coconut sugar mix will be runny, with extra moisture. Cook the mix over medium heat, until the sugar syrup is absorbed by the coconut and you have a sticky coconut mix. Let the mix cool down to room temperature, while you make the crepes. Grind the saffron strands along with 1/4 tsp sugar and 1/4 salt until the saffron strands are completely ground. Steep the ground saffron mix with 3 tbsp of hot water and leave it to cool down to room temperature. Add this instead of turmeric, if you prefer. BLENDER - place all the ingredients in a blender. Start with the liquid ingredients, and then add the dry ingredients. Blend until you have a smooth crepe batter. Let the crepe batter sit at room temperature, covered, for about 15-30 minutes to rest. WITHOUT A BLENDER - place all the dry ingredients in a large bowl. Whisk all the wet ingredients together in a jug. Make a well in the middle of the dry ingredients and slowly pour the wet ingredient mix, while whisking. After adding half of the liquid, whisk the mix to ensure there are no lumps. Add the rest of the liquid and whisk until smooth. Let it rest, covered, for 15 - 30 minutes until you are ready to use it. MAKING THE CREPES - heat a 6 inch non-stick pan over medium high heat. Brush some oil on the surface of the pan when it’s hot. Pour ¼ cup of the batter to the hot pan, while swirling, to evenly coat the surface of the pan. The batter will create bubbles on the surface if it's hot enough (this is characteristic of Sri Lankan crepes, but it's optional). Cover any big holes with some loose batter. Cook for about 30 seconds, until the edges turn a golden brown. Loosen the crepe and flip it over, and cook it for a further 15 - 30 seconds. Both sides should be a golden to dark golden brown in color. Flip the crepes on to a plate and stack them on top of each other until you have cooked all the crepes. Once all the crepes are cooked, cover the stack with a clean cloth or plastic wrap and let it cool. A NOTE ABOUT THE CREPES - if the pan is not as hot, the crepes will take a little longer to cook, and the surface will be smooth (no bubbles), but still flip the crepe when the edges start to brown. These will then look more like French crepes. Spread about 2 tbsp of the coconut filling in the center of each crepe. Fold over one end, over the filling. Fold the edges in and roll up the crepe roll to form a log/roll - Similar to how Spring rolls are rolled up. Place the crepes on a plate, with the seam side down. Cover the crepes with a cloth or plastic wrap until needed. Eat them plain, or with a cup of tea. Enjoy! If you are unable to find both - you can use dark brown sugar instead. 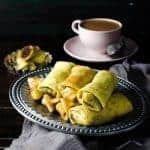 If you liked this sweet coconut stuffed crepes (pani pol / coconut pancakes) recipe, don’t forget to subscribe for new (and free) recipes by entering your email address on the side bar (and get all these recipes delivered straight to your inbox), so you don’t miss out on a thing. You can find me on FACEBOOK, TWITTER,INSTAGRAM, PINTEREST, YOU TUBE and GOOGLE-PLUS too. Hi, can this be eaten cold or at room temperature? Or does it have to be warmed before eating? I want to make this (ahead) for a lunch potluck! We actually prefer eating these at room temperature, but it can be eaten cold too. It definitely doesn’t need to be eaten warm, but either way works fine! I tried the recipe and it was delicious. I reduced the amount of sugar to 3/4 cup and it was still a bit sweet but otherwise the crepes were great! I used saffron strands and it gave it a nice subtle flavour. Like you I grew up eating pol pani pancakes. However, I’ve never made them, and after trying your recipe I have a new appreciation for the people who magically made these delights appear on our dining table.. The pol pani came out divine, and the pancakes were yummy. I just could not get the colour right. Mine were more brown than golden, but the pancakes were fluffy, soft and melted in my mouth. You have written your recepe so well thank you. Such a tasty looking recipe! I love crepes in all forms, sweet and savoury, and these look so delicious!